Waking up late at 11:31 a.m. I'm supposed to be at work. But it's okay. Cinnamon Raisin Toast. Orange Juice. Another hot and sticky day! Half of a Peanut Butter Bagel. Tortilla Chips with Avocado and Salsa. Honey Green Tea. It's a slow but steady shift. Delivering an order to the Ocean Palms Motel on 29th and Arctic. An old friend of my parents lives in one of the apartments. We reconnect. He introduces me to some cowboy looking dude wearing a Hawaiian shirt who's got a raspy drunken kind of voice, a character straight out of a movie. I love this hole-in-the-wall place. Leslie visits The Wok. She entertains the daughters with new crayons and coloring book pages of Hello Kitty. Riding around with me on a few deliveries. A couch surfer from Spain arrived at the house early this evening. He's a freelance journalist. While cleaning up the kitchen I discuss my blog project and other points of interest with him. A bowl of Honey Bunches of Oats with Milk. 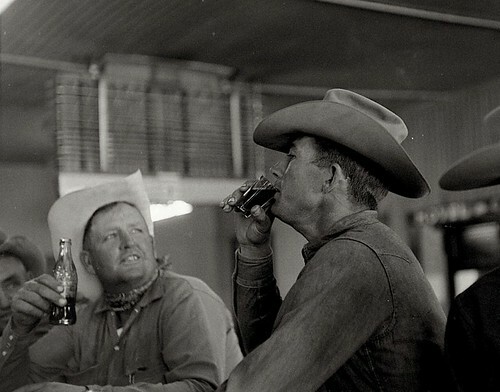 [i] Cowboy in Bar. Source unknown.